38 tasks across seven categories. At least 1,500 miles. One unbeatable Maine summer. Use this list as your Maine summer vacation guide! Do as much or as little of it as you want. 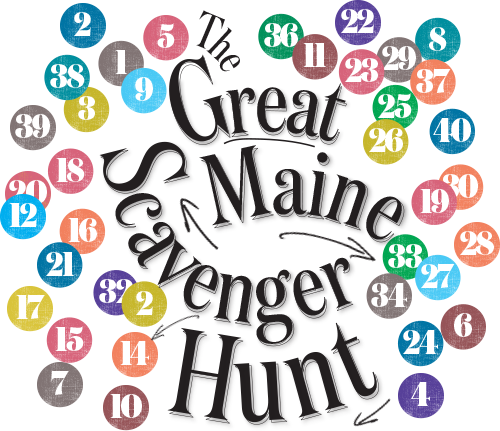 Hey, for most folks reading this, the scavenger hunt is just a gonzo way we’re calling attention to some of our favorite Maine summer destinations and adventures. So pick a few that capture your interest — including some you’ve never tried! — then head out and enjoy yourself! You won’t get any prizes, but you’re out having a fun Maine summer, and really, isn’t that better than any prize? Finish all of the tasks in a single category. So you’re an outdoorsperson, a foodie, a dedicated volunteer? Complete all the activities in any one of the seven categories that follow, and you’ll win a handsome matted print commemorating your achievement, along with a shout-out in a forthcoming issue of Down East, in which we’ll salute our summer scavenger hunters. How to show us you’ve really completed these undertakings? Each entry includes an explanation of a corresponding selfie request. Grab your phone and shoot a picture of yourself as the entry describes. Then, create a profile at downeast.com/greatmainescavengerhunt and upload your photos to show us what you’ve accomplished. For example, to “win” at the Outdoors category, a scavenger hunter will upload six total selfies, one corresponding to each of the tasks on pages 70–73. We will confirm with all the winners within three weeks of receiving a full category’s worth of selfies. Complete all of the activities in more than one category (but fewer than all seven) and we will admire you that much more, although the prize is the same. Complete all 38 fun, eye-opening, challenging, delicious, adventuresome items on this list. Dozens of (seriously) dedicated Down East readers achieved this in 2018. If you head out and complete every one of the activities on this year’s hunt, and you upload all 38 of your corresponding selfies matching each selfie description to the portal below, you too will have won our admiration. And truly enjoyed the best Maine summer ever. Here’s what else you’ll win: 1) a 2-year subscription to Down East, 2) a matted souvenir photomosaic of your selfies, 3) an open invitation to visit the editorial offices of Down East, in Rockport, where an identical photomosaic will hang in a place of high honor. Upon such visit(s), you will be lavishly praised and asked many questions about your feat. Boothbay Harbor Oceanside Golf Resort, Sebago Brewing Company, Renys, Maine Audubon, L.L.Bean, and Maine Maritime Museum — for making this scavenger hunt extra cool. You’ll be reading a lot about selfies on the following pages. “Selfie” means you need to be in it, with the exception of any entries in the Family category, for which having your kids (or someone’s kids) in it is an acceptable alternative. If you’d like to squeeze others into your selfies, go for it. If somebody else takes a photo of you, that’s okay too. But please read the description of the selfie requirement for each item — each pic should show an attempt to include what we’ve asked for in the background. If it’s imperfect — a sign is out of focus, a mountain gets cut off — don’t panic. We’re only taking this so seriously. Please don’t rely on our short entries alone for directions and info about locations. We’ve provided websites and contact info; do some homework before hitting the road. No selfie requirements ask you to prove a purchase — that is, you’ll not be asked for evidence that you bought something or paid an entry fee (of course, each task involves travel). If an unforeseen disaster or closure prevents the execution of a selfie requirement as described (say, a sign we’ve asked you to photograph has been destroyed), use your best judgment and take a photo that somehow shows us you’ve completed an activity — you’ll be able to include a note with your photo uploads. If you’re really going for the gold, it’s going to take some planning. Five of the tasks on this list (#3, #9, #14, #21, and #24) are pegged to specific summer festivals on specific dates. Those dates are highlighted in the entries that follow, so be sure to mark your calendars now. The other date that really matters is Labor Day — Monday, September 2, at 8 p.m. eastern time. That’s the hard cutoff by which you must have all your selfies uploaded to downeast.com/greatmainescavengerhunt in order to be eligible for a prize. That gives you all of May, June, July, and August to complete the hunt. Of course, we encourage you to keep having fun exploring Maine after that — you just won’t win anything for it.